The Hottest Trend on the Red Carpet This Year? USTREAM! The People’s Choice Awards made major buzz in the Entertainment universe last week, engaging fans around the world with the power of live video. 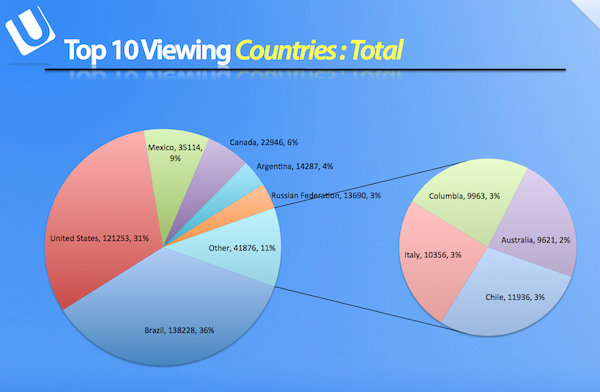 Showcasing the best of television, movies, and music, this year’s award show was not only decided by the fans, a record number of viewers took advantage of watching every moment in live time on the Ustream platform. 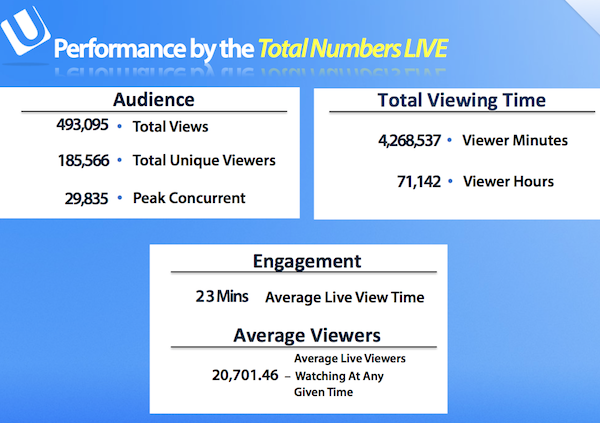 Combining live video with innovative social features was the night’s big winner, bringing in over 135,000 viewers; confirming our culture has become restless as television-watching bystanders. The popular demand is NOW, as we have become accustomed to instant, information delivery thanks to the internet and Twitter. Notoriously known as a trend-setting enterprise, it should come to little surprise that People’s Choice have broadcasted their popular event on Ustream for the past three years (Award show included). Flashing lights, fashion forward gowns, and spur-of-the-moment awesomeness was all caught live to the delight of many. Live video is swiftly replacing archaic production standards, allowing broadcasters from any budget to add glitz to their live streams. Let’s take a look at the biggest moments of the star studded event, the staggering viewer stats, along with tips on how you too can add Hollywood flair to your next broadcast. Want your next broadcast to have the glamour of a red carpet event? Here are some basic steps to streaming video production. Some streaming options combine some or all of these elements into a single device. For example if you use a mobile phone for streaming, your phone has all 5 elements built-in. For more advanced streaming setups, you may need to combine various pieces to meet your needs. Basic: All streaming elements integrated into a single device, like a mobile phone or a laptop. Advanced: Separate elements are used for increased flexibility and specialization in the video production and streaming workflow. The beginning of any live stream is capturing a video image. This can be done with a simple camera, such as the built-in one on your mobile phone or laptop, with a professional video camera, or with the output signal of a video switcher. Advanced: Analog, HDMI or SDI cameras, or the output of a video switcher, going into a video capture interface. Capturing clean sound and broadcasting it at the right level is essential for any broadcast. Your mobile device or computer has a built in mic that works if you’re capturing something right in front of you, but typically you’ll want to use external microphones placed as close to your presenter as possible, or get a feed directly from the PA system soundboard. There are a couple ways to do this. You can input audio directly to your camera and this audio gets embedded with the video signal and fed into the encoder. Or you can input audio to your encoder via your computer’s audio inputs, audio inputs on a capture card, or a USB audio interface. Basic: Built-in microphone on your camera, mobile device, or computer. Advanced: External microphones, routed into an audio mixer and fed into the camera, computer, or a hardware encoder. If you’re using a professional camera or video feed from a switcher and you’re using encoding software on a computer rather than dedicated encoding hardware, you may need to add a capture box or card to digitize and convert the video signal so it can be recognized by the encoding software on your computer. If you’re using the built-in camera on your mobile device or computer, a USB camera, or a dedicated hardware encoder, you won’t need any additional capture device. Basic: If you’re using a built-in camera or a USB camera, you won’t need any capture device. Advanced: When you’re using professional cameras, you’ll need to either buy an encoder that has a built-in capture interface, or add capture cards or boxes to your computer. The purpose of an encoder is to take a video signal and compress it into the correct format to stream across your internet connection and send it to Ustream’s servers. In many streaming setups, the encoder is integrated with the broadcasting or switching software. For example, Ustream mobile apps, Ustream’s Web Broadcaster and Ustream Producer all have built in encoding, so no separate encoder is required. In professional video setups it’s common to have a dedicated piece of software or hardware that does only encoding and separate hardware and software is used for capture and switching. Basic: Ustream’s mobile apps and Web Broadcaster have built-in encoding. Advanced: Ustream Producer or Ustream Certified Encoders. A solid internet connection is one of the most important aspects of being able to stream live. Without a good internet connection, you won’t be able to stream at all. Before streaming, you should always test your current upload bandwidth at www.speedtest.net. Once you conduct your speedtest, you want to look at what the *upload* speed is and set your encoder’s bitrate based on that. You never want to be using more than 50% of your available bandwidth. A low quality stream can be done on as little as 600-800kbps upload speed. For a medium quality stream, a minimum of 1.5Mbps upload bandwidth is required. For higher quality and HD streams you’ll want 4Mbps or greater upload speed. If you are using Ustream’s mobile apps, Web Broadcaster, or Ustream Producer and you have a strong internet connection, you might not need to worry about changing any encoding settings. If you are using a 3rd party encoding device or want to increase your quality, you will want to test your bandwidth and learn how to set an appropriate bitrate for your stream to maximize your quality and ensure an uninterrupted high quality stream. Basic: 4G, WiFi, or whatever connection you can find. Advanced: Ethernet connection with dedicated bandwidth. Ready to take your broadcast to the next level?